A nice, useful set for your kitchen! for longterm results in durability and heat retention. Good stove top cookware helps make cooking fun and easy. Stainless steel material Offers durability, dependability, and good performance. Tempered glass lids Are heat resistant and offer the ability to see cooking food without losing heat by lifting the lid. Dishwasher safe Permits easier cleaning with appliance hot water and swirling water. 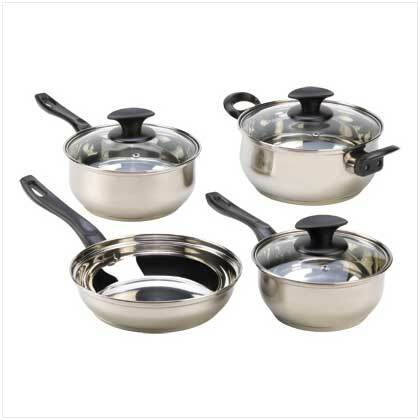 Assorted sizes in pots and pans Offer multi-uses at the same time for meal preparation. Long handles Permit a sure grip and easy lifting of hot, filled pans.